Bat mortality at wind turbines in nortwestern Europe. Do current bat (Desmodus rotundus) population control pratices pose a threat to Dekeyser's nectar bat's (Lonchopylla dekeyseri) long-term persistence in the Cerrado? Nocturnal activity patterns of lactating silver-haired bats (Otonycteris hemprichii) during pregnancy and nursing. 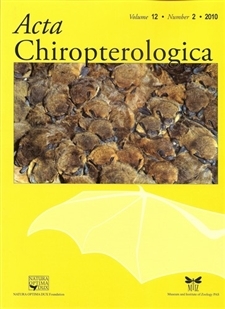 The implications of sympatry in the spectacled and grey headed flying-fox, Pteropus consicillatus and P. policocephalus. Echolocation call analysis and presence-only modeling as conseracion monitoring tools for rhinolophoid bats in Thailand. Intra- and interspecific responses to Rafinesque's big-eard bat (Corynorhinus rafinesquii) social calls. Why the bat did not cross the road? The diet of Indiana flying-foxes (Pteropus giganteus) in urban habitats of Pakistan. Predation by free-roaming cats on an insular population of bats. A test of mist-net configurations in capturing bats over stream corridors. A recent inventory of the bats of Mozambique with documentation of seven new species for the country. Karyotypic variation in rhinolophid and hipposiderid bats. Range-wide population genetic structure of the pallid bat (Antrozous pallidus) - incongruent results from nuclear and mitochondrial DNA. A taxonomic review of the Hipposideros bicolor species complex and H. pomona in Thailand. Morphological evidence for hybridization in the sister species Myotis myotis and Myotis oxygnathus in the Carpathian Basin. Revalidation of Myotis taiwanensis and its molecular relationship with M. adversus. The status of the cryptic bat species, Myotis mystacinus and Myotis brandtii in Ireland. Vesperilio murinus confirmed in Japan from morphology and mitochondrial DNA. Myotis alcathoe confirmed in the UK from mitochondrial and microsatellite DNA.